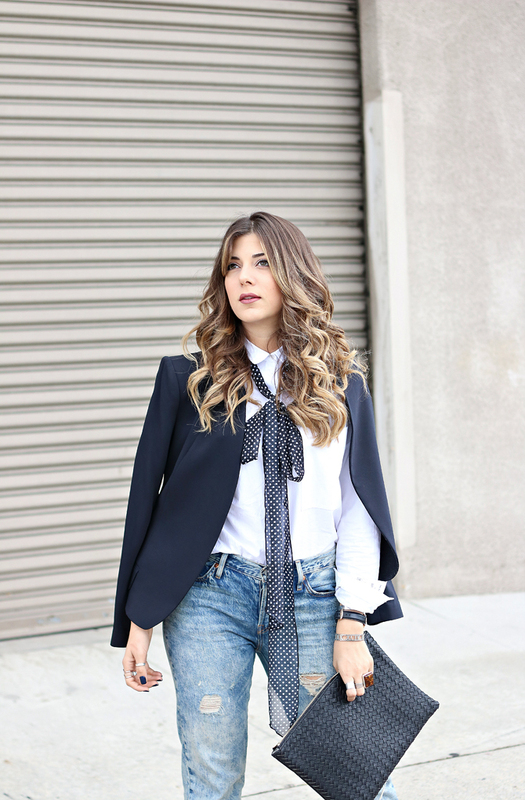 The skinny scarf - the fall accessory you never knew you were missing. It's not exactly new and Kate Moss has been including it in her wardrobe for the past decade but in my book, I consider it totally new. I love the sudden rush of excitement for accessories that comes with fall and the skinny scarf has stolen the spotlight for me! Although it's not very practical, such as providing warmth, it adds interest to anything! I chose a crisp white blouse for a rainy day and added the polka dot scarf as an interest to add some flare to the whole look. This accessory is so versatile and can be worn in many ways. I chose to center it a the nape of my neck, wrap it around once, and tie it in a bow. The ends were hanging freely but since it was a print, it gave the look an illusion of a dimensional button-up shirt.